He&apos;s been following me his whole life," said Jimmy Selby with amazement as he watched his brother Robert walk along a hallway at the University of Illinois at Chicago pointing out out doorways and edges without using his cane. Jimmy caught up with Robert, who had wandered into someone&apos;s office. "I&apos;m just looking around," Robert said. The two of them broke into laughter. Robert Selby, a legally blind 54-year-old man from Hazelwood, Missouri, has retinitis pigmentosa, or RP -- a rare, inherited condition that progressively robs sight, leading to blindness or near-total blindness. 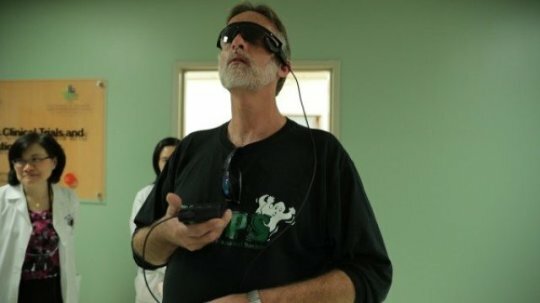 But with the help of an artificial retina called the Argus II, which was implanted in his left eye in late October at UIC and turned on on Nov. 16, he hopes to be able to get around more independently and safely. He is the first person from Missouri to receive the implant, and one of about 60 people people in the U.S. with an Argus II. Within moments of the device being turned on, Selby reported seeing "flashes of light." The flashes indicate borders or objects -- either a person or a doorway or other edge. "Wow. I can see how much work its going to take to be able to interpret what these flashes mean, but this is already so amazing," Selby said. "I&apos;ve got a lot to learn." Selby scanned the room filled with family members and UIC faculty and staff and picked out the location of each person, who he was able to "see" by the flashes of light they produced through the Argus II. "There&apos;s one, there&apos;s one, there&apos;s one," he said. Selby, who lives with his adult daughter and granddaughter, started losing his sight at around age 8. "I was just constantly bumping into things and had a hard time with peripheral vision," he said. He would often follow the sound of his younger brother Jimmy&apos;s voice. His vision gradually worsened to near-total blindness by age 20. Selby had been following the development of technology that held the promise of renewed sight. In 2013, the Argus II retinal prosthesis, made by Second Sight, was approved by the FDA to treat RP, and UIC became one of only 13 centers in the U.S. to offer the device. Approximately 400,000 people worldwide are legally blind due to RP. Dr. Jennifer Lim, the Marion Schenk Chair for Research of the Aging Eye and professor of ophthalmology in the UIC College of Medicine, led the surgery to place the Argus II electrode array of the Argus II on Selby&apos;s retina. "Its humbling and gratifying that after so many years of following the development of this kind of technology, that now I can see it work in one of my own patients," said Lim, who is director of retina services at UIC&apos;s Illinois Eye and Ear Infirmary. The Argus II consists of a miniature camera housed in a pair of glasses that converts video images into electrical impulses that are transmitted wirelessly to an array of electrodes implanted on the surface of the retina. The pulses stimulate the retina&apos;s remaining light-sensitive cells, which send signals through the optic nerve to the brain, where they are translated into images. "My brother jokes that the implant might be able to pick up some paranormal activity," Selby said. He and Jimmy are casual "ghost-hunters" and use audiovisual equipment to pick up unusual signals and investigate reports of hauntings around the St. Louis area. The device will certainly provide no benefit to Selby in his beep-ball game, which is played by both blind and sighted players wearing blindfolds. Selby is a member of the St. Louis Firing Squad, a beep-ball team that won the Mind&apos;s Eye 2016 Beep Ball Tournament in July that drew 22 teams from the St. Louis area. As in baseball, beep-ball players need to hit a ball thrown by a pitcher and run the bases. The pitcher is on the hitter&apos;s team, and the ball, as well as the bases, beep. Argus II patient Robert Selby; retinal implant; Argus II Argus II patient Robert Selby. "Having some vision isn&apos;t going to really help, but I think some of my teammates and others in the league we play in who are blind from retinitis pigmentosa might be interested in learning more about my implant," Selby said. Selby will undergo extensive training at the UIC Illinois Eye and Ear Infirmary to learn how to use the device and how to interpret the signals it provides, Lim said. "It will take a while to learn how to scan using the camera on the glasses, and also figure out what the flashes of light mean," said Lim. In earlier clinical trials of the Argus II, participants were better at tasks like detecting street curbs, walking along a sidewalk, and perceiving objects like windows and doors. Some were able to sort light and dark laundry and read large letters (about 9 inches high). "In terms of what other patients have seen, its not going to be regular vision, where you can see faces and recognize small features," Lim said. "But it will give him more freedom and confidence in getting around and navigating through his environment."